What it is: Ultra-concentrated formula is a gentle, yet powerful shock treatment to deliver the ultimate in skin rejuvenation. Formulated with an extraordinarily stable form of Vitamin C at a potent 30% concentration along with pure 24K Gold to diminish dark spots, pigmentation, and renew lifeless skin. What it does: This together with our Rare Black Baccara bio-adaptative Rose Concentrate, an active Molecular Youth Elixir, it instantly enhances radiance, brightness and luminosity while softening the signs of aging and sun exposure, revealing a more uniform, radiant tone. Who it's for: For all skin types (non irritating), especially those with: exposure to urban stress and pollution, exposure to dry climates /sun damage, lifeless skin/dullness, first signs of aging: lines, wrinkles and loss of firmness, pigmentations and irregular tone, including age spots, redness and acne. What it’s free of: Formulated without Sulfates, Parabens, Mineral Oils, Phthalates, Paraffin, Petrolatum, Preservatives, or Silicones. 1. Pre-blended Application: Apply 2-3 drops of each of your selected Black Baccara Dynamic Booster(s) to the palm of your hand. Next, add a small amount of your selected Black Baccara Bio-Adaptive Moisturizer. Mix well and spread the blend in an outward motion beginning from your forehead, nose and cheeks, working your way down to your chin, neck and décolleté until fully absorbed. 2. Layered Application: Use 2-3 drops of the 30% Vitamin C + 24k Gold Booster and apply in an outward motion beginning from your forehead, nose and cheeks, working your way down to your chin, neck and décolleté until fully absorbed. Finish application with a gentle tapping motion. Repeat with any additional Boosters. Follow with your specified Black Baccara Bio-Adaptive Moisturizer. Rare Black Baccara Rose Youth Concentrate: Creates an ideal microenvironment to protect against negative epigenetic factors (stress, lack of sleep, poor diet, etc.) that can lead to accelerated aging. Detects skin's exact needs and adapts to provide necessary protection against internal and external stressors. Regulates cellular “clock” that can be offset by our lifestyle ensuring cells function properly. 30% Vitamin C Ester (Ascorbyl Tetraisopalmitate): Advanced technology delivers an extraordinarily-stable Vitamin C at a very high, yet gentle 30% concentration. Cutting-edge advances allow for superior skin penetration (50% higher than Ascorbyl Glucoside). Once it penetrates deep into the skin it converts to pure Vitamin C for the most targeted and powerful treatment. Promotes brightening and improves skin's condition while inhibiting melanin production, resulting in a brighter, healthier complexion. 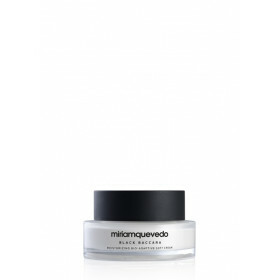 Has an anti-pigmentation effect, reducing the signs of age spots and preventing new ones from forming, also treats acne. Stimulates collagen production while also prevents lipid peroxidation. Potent antioxidant provides free radical scavenging activity, inhibiting UV- induced DNA damage. Pure 24K Gold Flakes: Hydrate, firm and moisturize the skin, while reducing fine lines and wrinkles, resulting in smooth and radiant skin. Lock in moisture and keep skin firm by stimulating collagen synthesis and protecting from environmental conditions. Antioxidant that prevents the accumulation of free radicals. Cold Pressed Chia Seed Oil: Extra virgin botanical oil extracted from the chia seed. Known as the skincare “Superfood” due to its abundance in high levels of proteins which increase collagen levels in the skin, phyto- nutrients (vitamins B, D, E, and niacin and minerals: calcium, magnesium, iron, zinc), PUFA’s (60% Omega-3, and 20% Omega-6), and ultra-rich antioxidants (has much higher cell-protecting antioxidants than blueberries), working wonders on the skin with preventive anti-aging activity. Contains skin calming and anti-redness properties. Balances skin to reduce inflammation in eczematous, itching and uncomfortable skin. Restores moisture, improving cutaneous barrier and reinforcing the epidermis. Prevents sun damage and improves skin softness and elasticity. Squalane Oil: Natural oil derived from olives, this super-hydrating oil is an excellent moisturizer leaving skin hydrated, plump and soft, reducing the appearance of fine lines and wrinkles. Has a high penetration efficiency that makes it an excellent transport system that helps the skin absorb other active ingredients increasing their effectiveness.